From musicians to magicians, Cirque Colors drew inspiration from vaudeville shows of the early 20th century to create a 4-piece fall collection called Burlesque. These sultry holographic shades embody the lush and dramatic stripteases that put such acts like the British Blondes and Gypsy Rose Lee on the map. Josephine, a dark forest green, pays homage to Josephine Baker (the original twerker) and her famous banana dance. While the navy blue hue of Trocadero represents a night out on the town at the historic Philadelphia theater. 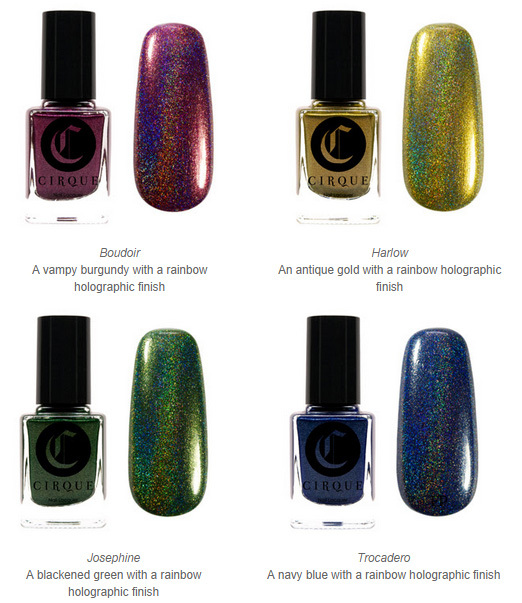 The Burlesque Collection will be available online at CirqueColors.com on September 25 for $13 each. Refer to the Stockists page for participating retailers.